The stretch of the Lower Kern River extending from Hobo campground to Miracle Hot Springs is particularly well suited to the sport of whitewater slalom kayaking. The course was built and is maintained by the Kern Valley River Council, a California Non-Profit Organization, under permit from Sequoia National Forest. 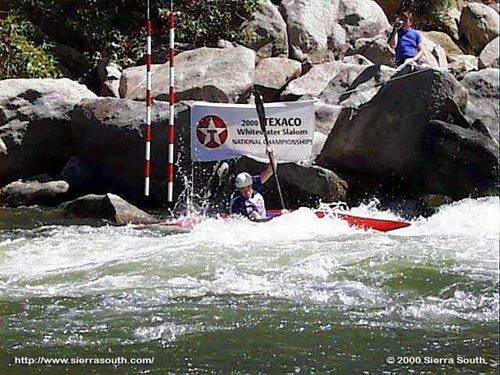 The Miracle Slalom has been held here since 1995 and the site was the venue for the 2000 Texaco Whitewater Slalom National Championships. World-class slalom kayakers Rebecca & Eric Giddens train extensively at the site and were involved in its design. Rebecca was a Silver Medalist at the 2004 Athens Olympics. In August 2005, an exciting three race series -- the Pan American Championships, America’s Slalom Open, and the U.S. Nationals -- will be held at Miracle. In whitewater slalom races, participants navigate a series of 18+ gates that have been strategically placed on a short stretch of river. Gates are marked red or green. Red gates are "up" gates and must be paddled through moving in the upstream direction. Green gates are "down" gates and, as you can probably guess, must be navigated in the downstream direction. Competitors are timed from Start to Finish. Should a racer touch a gate, 2 seconds is added to their time. If a competitor misses a gate, 50 seconds is added to their time.